If you’ve been following my blog, you’ll know how much I love organic products that really work. 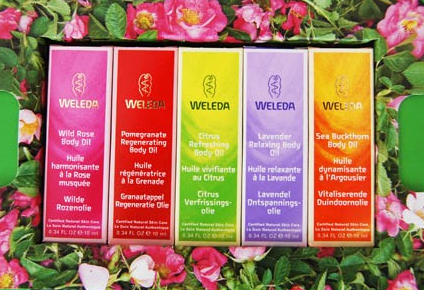 So Weleda’s Body Oils gift set is really up my street. As they are small sizes, it’s a great way to try out the oils before knowing which one you love the most and committing to buying the full size. The smaller sizes are also ideal for taking to the gym, or carrying in your hand luggage or handbag. There are five oils in the set that are guaranteed to cover all bases: Wild Rose Body Oil (to pamper), Pomegranate Regenerating Body Oil (to regenerate), Citrus Refreshing Body Oil (to stimulate), Lavender Relaxing Body Oil (to relax) and Sea Buckthorn Body Oil (to nourish and restore). So you have an oil for every need and state of mind you could possibly find yourself in. The bottles are 10ml each and the oils are so pure they are even suitable for vegans. Check it out on www.biggreensmile.com. Priced at £8.95. This entry was posted in Body and tagged Citrus, Gift set, lavender, organic, Pomegranate, rose, Sea Buckthorn, Vegan, Weleda. Bookmark the permalink.